The #PowerCouple is back with a great new song. 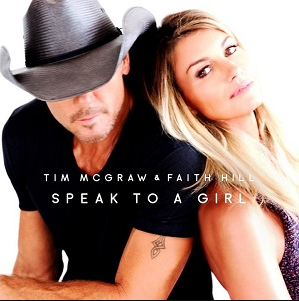 Tim McGraw and Faith Hill are, for the first time, on the same record label. Their labels have always played pretty nice in the past by letting these two record and release singles together. Well, things looked fine on the surface, but we probably won’t know for sure what was going on behind the scenes. Faith has always been with Warner Bros. Tim was recently with Big Machine. Now they’re both with Sony. I think it looks like specifically with Arista. Anyway, it sounds like there will be a full on co-album coming out later this year and this is the first single. Tim has been the more active artist over the last decade. He’s been able to find a bridge from his early career to his career today. That’s always tough because it’s very difficult to sing the same type of songs over and over. But Tim has found a new niche with songs like this one. They’re reflective. They’re about topics in life that aren’t always discussed in music. The theme for this one is about how to speak to women and girls. It’s something that us guys struggle with early in life and really throughout life. I know I’m still learning. Tim famously lives in a house with all women. He has Faith and their three daughters. I’m sure he’s learned a lot over the years, but I’m sure he would also say that he’s still learning. This one has a feel similar to Humble and Kind. We all know that was a huge hit. I think this one will be too.